On the last day of the conference, we went to Fatehgarh Sahib, a major pilgrimage center for Sikhs about 35 kilometers from Patiala. Once again, I am only showing a few photos, but let it be said that this a very beautifully maintained house of worship. This photo is taking in the basement of the building. 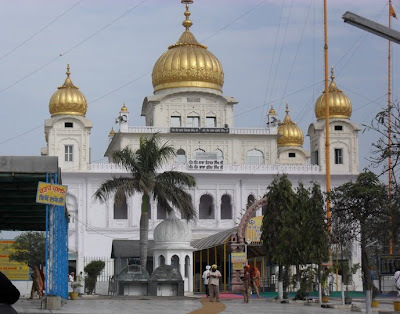 This gurudwara commemorates the assassination of Guru Gobind Singh's two young sons who were walled in alive while being told to convert to Islam or die. 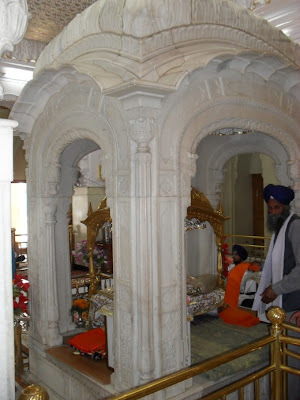 On either side of the sanctum sanctorum one can see there is akhanda path of Guru Granth Sahib. 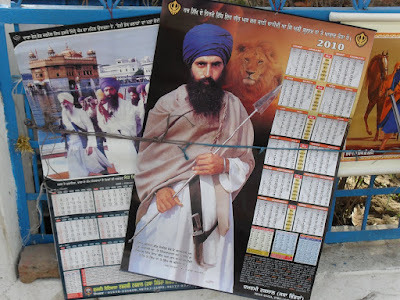 In the entire complex, there are a total of six such constant readings of the Sikh holy book. There was also a very mellow kirtan going on upstairs, with the names of Govinda and Gopal being sung. Sikhs don't think of Govinda and Gopala quite in the way we do, but it is nice to hear them sing these names. This is the altar on the main floor of the building. Spotless white marble and the entire building and grounds are kept impeccably clean. 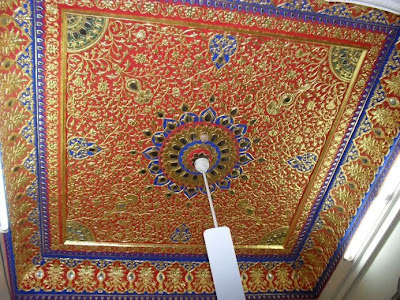 I was wondering whether I was allowed to be taking photographs--a lot of places don't like it so much--but as I was wondering, the manager of the Gurudwara pointed to the ornately decorated ceiling and told me to take a picture of it. "Gold," he said. Here is an iconographical poster being sold. Bhai Satiram Ji. 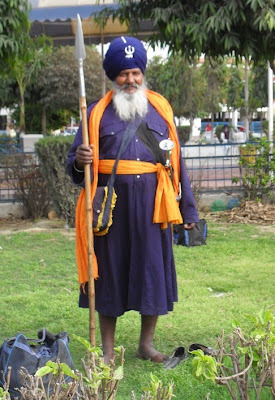 I don't know the story, but clearly arising from the the Muslim-Sikh wars period. 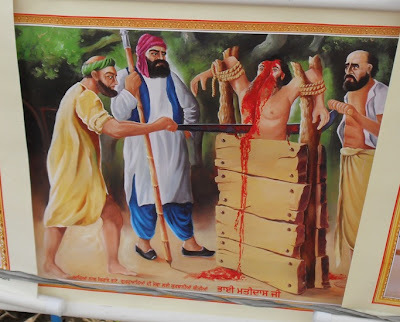 Another image of Sikh martyrdom. 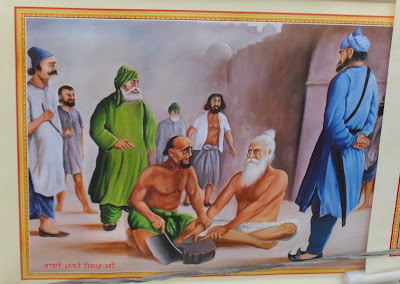 This one says Bhai Mani Singh Ji. Looks like he is about to lose a hand or a finger. This is a martyr from more recent days. This is Jarnail Singh Bhindrenwale. 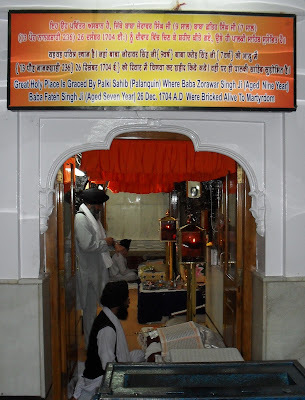 He died in 1984, which was a very eventful year for Sikhs--the Air India bombing, the attack on the Golden Temple and the assassination of Indira Gandhi, followed by the pogroms in Delhi, when Sikhs were massacred by angry Hindus. It seems that the resentments that led to the Khalistan demands are still simmering, and that was the elephant in the room at the Interfaith Dialogue and Peace conference. I talked to one of the participants about it in the train on the way to Delhi and he immediately became very passionate. "How can you forget this history?" he asked. This is our group (left to right) Dr. Jaspreet Kaur Sandhu, Prof. D.A. Gangadhar, Prof. Kazi Nurul Islam, Dr. Jagat Ram Bhattacharyya, Dr. Deepali Bhanot, Prof. Jodh Singh, Dr. Hardev Singh. 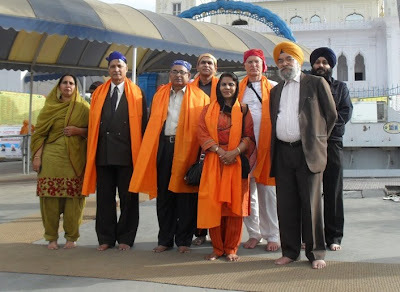 The orange siropas were given as a gesture of greeting by the head of the gurudwara, Amrit Singh.